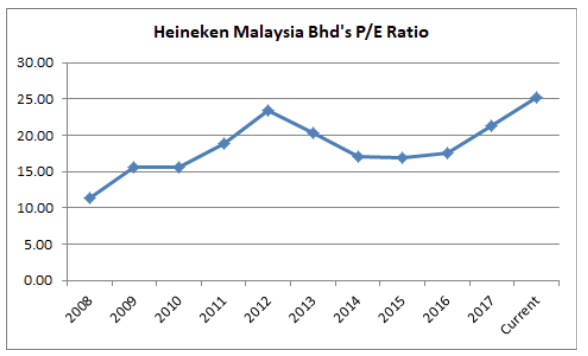 On 7 October 2015, Heineken N.V. has acquired Diageo’s stakes in GAPL Pte Ltd, a private firm that owns 51% stake in Guinness Anchor Bhd (GAB), one of the two listed and licensed breweries in Malaysia. Thus, Heineken N.V. has emerged as GAB’s largest shareholder as it now owns 100% interest in GAPL Pte Ltd. 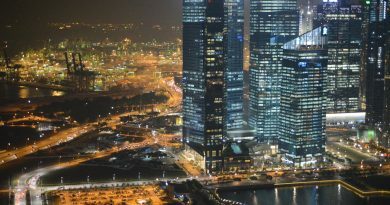 Subsequently, GAB was renamed to Heineken Malaysia Bhd (HMB) to reflect and be aligned with Heineken’s corporate identity. Heineken: The World’s No.1 International Premium Beer Brand. 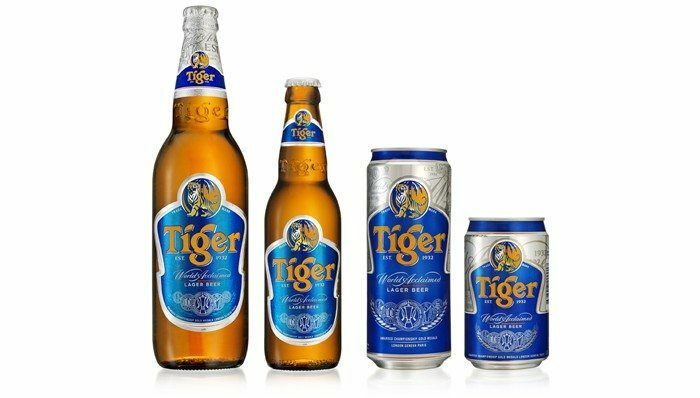 Tiger Beer: Iconic Beer Brand across Asia. Guinness: The World’s No.1 Stout. Strongbow Apple Ciders: The World’s No.1 Cider. Apple Fox Cider: Inspired Cider from New Zealand. In 2012, HMB paid out RM 181.6 million in special dividends to shareholders and hence, reducing its shareholders’ equity from RM 516.6 million in 2011 to RM 379.7 million in 2012. 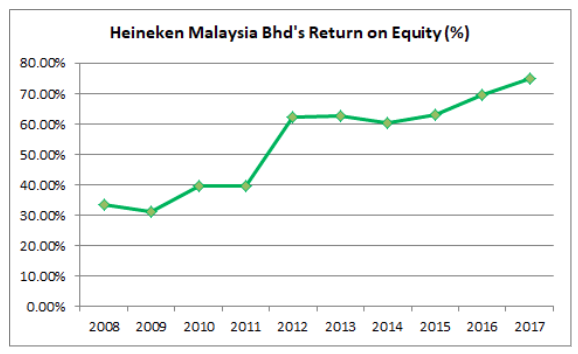 As a result, it significantly increased HMB’s Return on Equity (ROE) from 30-40% levels achieved in 2008-2011 to about 60-70% levels in 2012-2017. In 2017, HMB has achieved a ROE of 74.91%, the highest in 10 years. This means, HMB has generated RM 74.91 in annual earnings from every RM 100.00 in shareholders’ equity in 2017. As at 31 March 2018, HMB has zero borrowings, has 1.51 in current ratio, and RM 15.3 million in cash reserves. 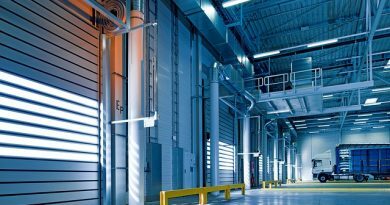 HMB is in itself a cash-business and doesn’t need to rely on debt or raising new equity to finance its operations and plans for growth in the future. Paid out RM 386.36 million (around 16%) in capital expenditures. Paid out RM 2.16 billion (around 84%) in dividends to shareholders. RM 34.2 million: Claimed under the Excise Act 1976 from 28 August 2012 to 31 October 2013. RM 22.2 million: Claimed under the Sales Tax Act 1972 from 1 July 2012 to 31 October 2013. 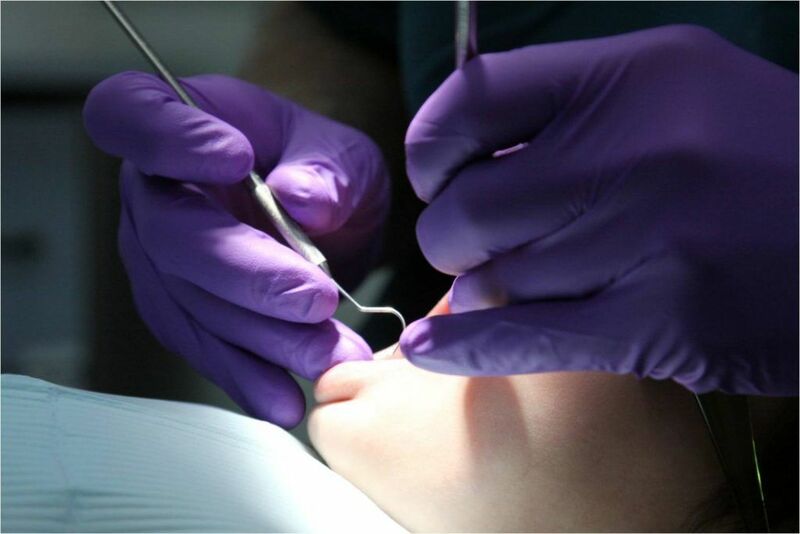 The additional payments are based on a new method of valuation for excise duty which came into effect on 1 November 2013. The abovementioned bills of demand are based on historic claims for both excise duties and sale tax for the aforesaid period. HMB strongly believes that the new method of valuation is not justifiable for the excises & sales tax payable for the period before 1 November 2013, hence, does not admit liability to the bills of demand. HMB would make timely and accurate announcements on this matter from time to time if necessary. 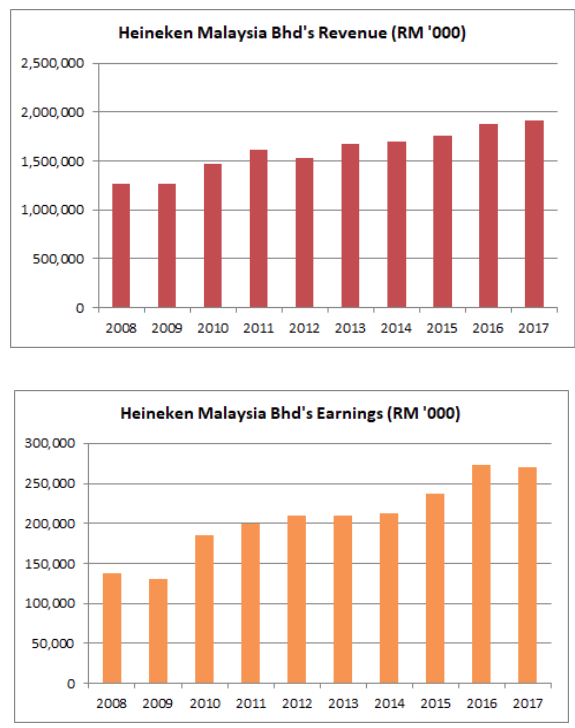 HMB grew its earnings per share (EPS) from 45.6 sen in 2008 to 89.4 sen in 2017. At a stock price of RM 22.54 a share, HMB’s current P/E Ratio is 25.21. At current price, HMB is trading at its highest P/E Ratio. 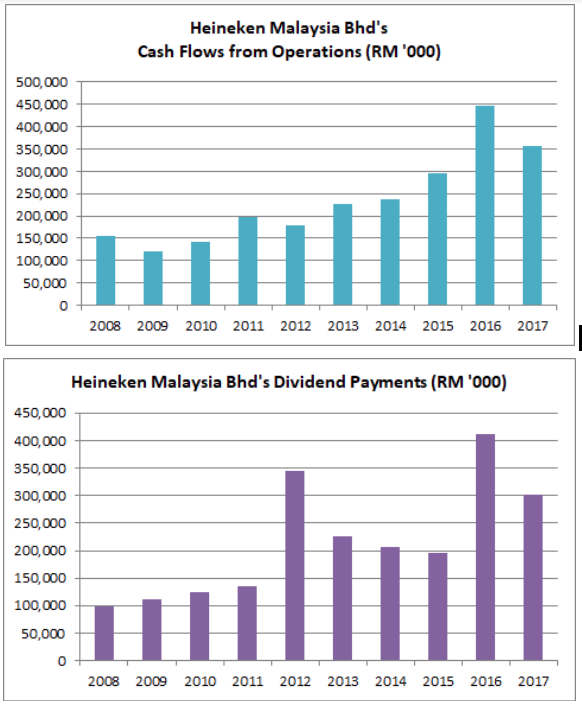 HMB has increased its ordinary dividends per share (DPS) from 24.0 sen in 2008 to 90.0 sen in 2017. 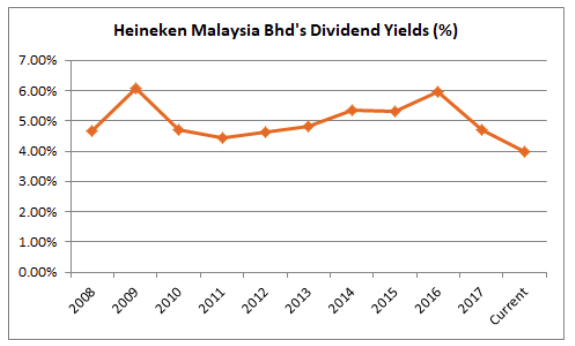 At a stock price of RM 22.54, its dividend yield works out to be 3.99%, the lowest in 10 years. ← Is It Time To Finally Buy Starhub Ltd?